On October 19th, the HCMUTE Labor Union held the Jello decorating competition 2017 with the topic “Loving family” in order to celebrate the Vietnamese Women’s Day. There were 23 teams of 2 members (1 male and 1 female) participated in the competition to represent teachers and staffs from the labor unions of faculties, offices, institutes and centers. Every team was excitedly preparing to cook the jello. In the joyful environment of the activities to celebrate Vietnamese Women’s Day (October 20th), the competition was considered to be a place for women to show their capable, caring and creative essence by taking care of their families, being “Almighty Women” and the pride of Vienamese Women. In particular, the “candidates” were male teachers, and these special “candidates” did an extremely spectacular and creative work which were fully artistic that made the viewers hard to believe that those were made by the technical teachers. The products were displayed for marking. The competition’s requirements were that the jello should be well decorated, colorful, unique, creative; ensured the food safety; the jello should also be crunchy, tough, good and were applied the relatively difficult and modern techniques. The presentation of the product part of the competition. After nearly 2 hours of the competition, all teams were ready with the products. Beside the main course which is Jello, these teams prepared other side dishes such as juices, fresh fruits or tea in order to diverse their menu. To complete the competence, the teams had to present about the topic of each product. 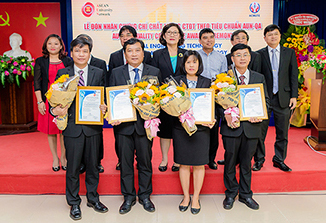 According to Vũ Minh Hạnh M.A., dean of Faculty of Garment Technology and Fashion Design – main examiner of the competition, the jello quality of all the teams were equal, and the creative and spectacular displays of them made her hard to decide the winner. The winner was the one who had the product which mostly met the requirements, harmonised from attractive display to creation and techniques. The Academic Inspectorate Office outstandingly won the first prize of the competition. The competition was not only the place for teachers and staffs to reveal their cooking abilities or their skillfulness but also to exchange and share experiences and present the solidarity among the HCMUTE’s staffs.